I have a complicated relationship with art. I absolutely love painting/reviving furniture & home decor, but when it comes to creating an actual painting everything I know flies right out the window. I’m terrible at painting figures & objects on my own, yet I have the desire to create art for my home. I’ve found that there are plenty tricks around covering up my lack of artistic ability. In the past I’ve used objects as painting & photos as aids, like in the case of my fish stamp prints. 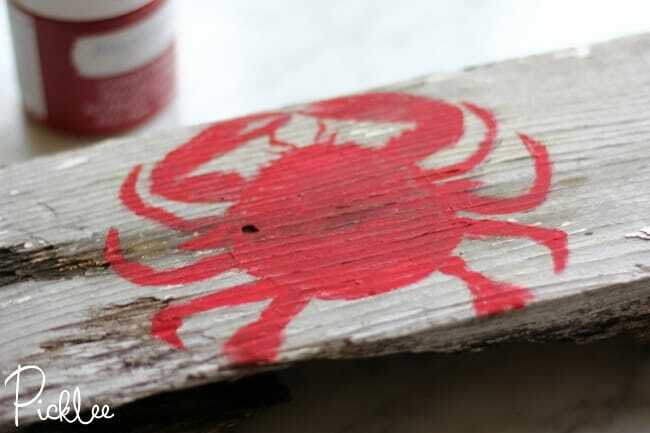 Today I’m doing something similar with wax paper image stamps & chalky finish paint! 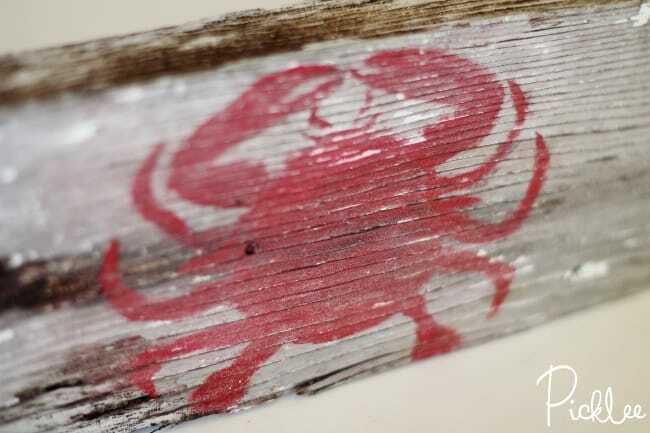 Select an image you’d like to print onto your driftwood, I chose a basic red crab. Cut a piece of wax paper into an 8.5″ x 11″ sheet. 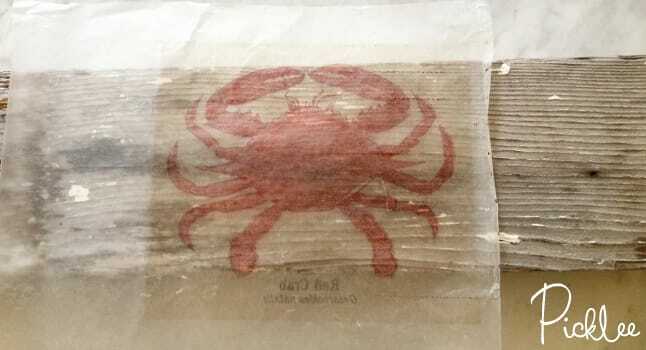 Feed your wax paper into your ink jet printer and print the image. Since the wax paper is so thin, this step took me a couple tries…I found that its best to hand feed the paper into the printer. Now you’re able to fill in the object with paint, if you can color in a coloring book you can complete this painting! I used chalky finish paint for this step because it has more depth & is super simple to distress (perfect for the vintage art look). 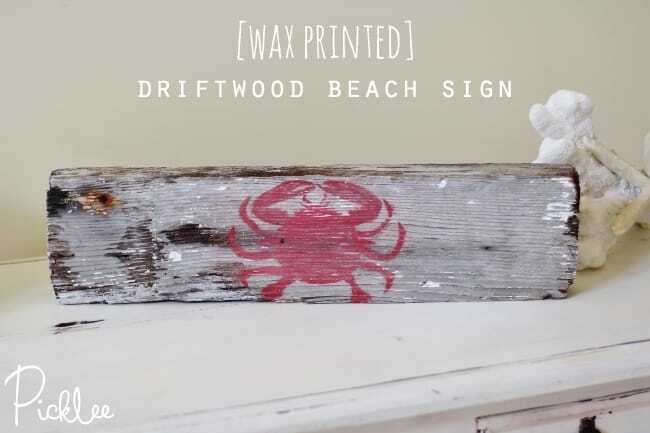 Creating driftwood art is as simple as that! As I was reading this I thought of how I have felt the same way for years! Love crafts and painting my my perspective is always off! 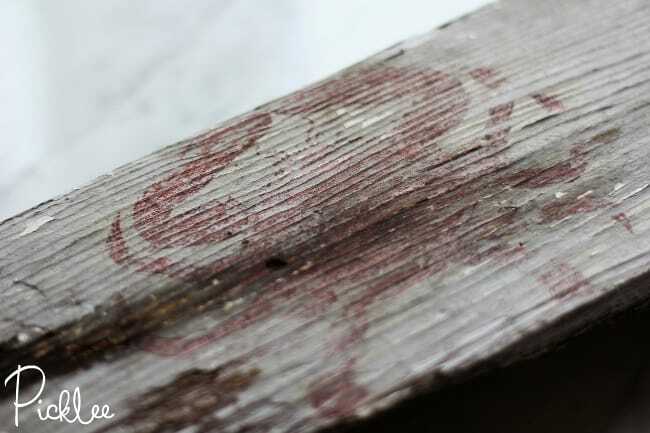 Thank you for sharing this interesting way of transfering onto wood. I have no drift wood but I have plenty of aged pallet wood and plan on doing it soon. 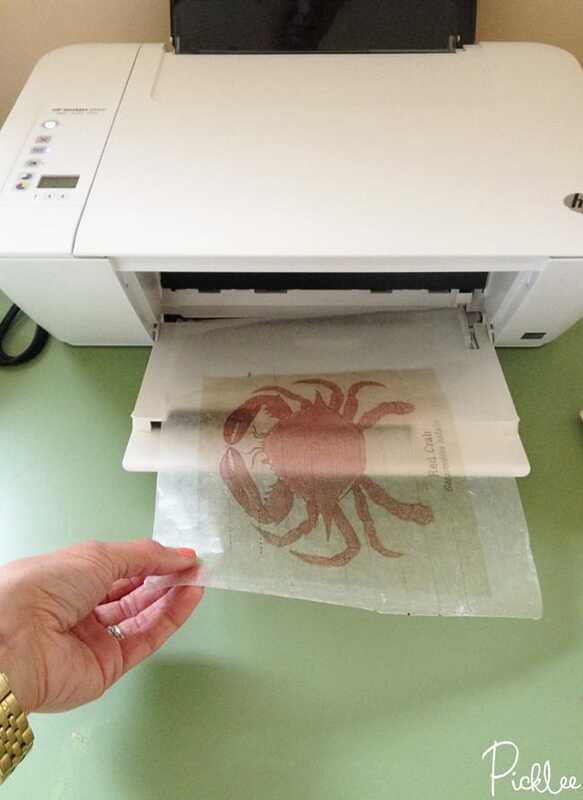 Sometimes my printer will print on wax paper – sometimes it won’t – what’s the deal? I love making my own wood projects. But like you, am not confident in my ability to free-hand. LOVE this idea!! Thank you for sharing!! There are many graphics programs (some not very expensive, I use Paint Shop Pro) which allow you to reverse the image before printing. I have never tried printing on wax paper and am concerned about damaging my printer, but I do know about the software. Totally messed up my printer. Try taping the wax paper to a sheet of priinter paper. The wax paper curls near the end of the roll and gets caught in some printers. Hope this helps. when I print on the way paper it turns my objects backwards, what can I do? My letters do the same help!!! Use mirror image when printing. If you have a program such as Photoshop, you can “MIRROR” your photo. It will print the photo and letters backwards, but no worries, then when you transfer, it will be correct. It’s just the same if you are painting on the backside of a piece of glass. 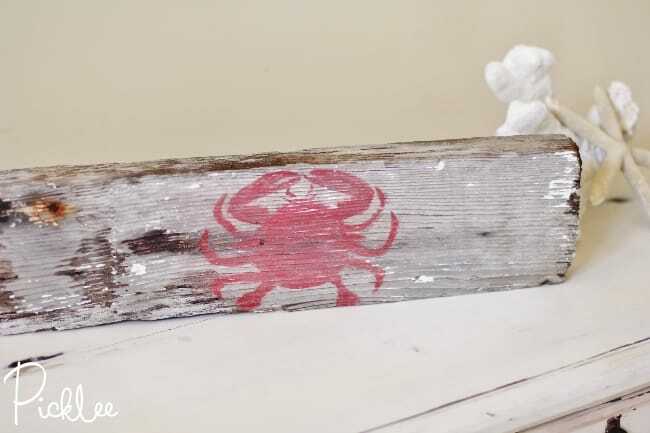 That is a very cool idea, I love the driftwood. I had no idea wax paper would work in printer. Can’t wait to tey it. Wow……this is so cool! I feel exactly the same. Whilst I will always attempt most anything with paint I always feel there is something lacking when I try to do actual artwork. This is an amazing way to disguise my lack of actually being able to do it myself. Thank you for posting. Love it! I give you 5 pickles it’s a awesome idea! Thank you so much! This is a very funcraft. I have done a lot of these, mostly old food signs. A little trick I learned is to take a piece of computer paper an with a few small pieces of s tch tape,adhere the wax paper to its corners. This keeps the wax paper flat, as it has a tendency to curl and wrinkle as it moves through the printer. Also I found baking parchment paer is a little stiffer and works better. Good luck and have fun. I was wondering did you do anything to distress this wood any further or was that something you had already. 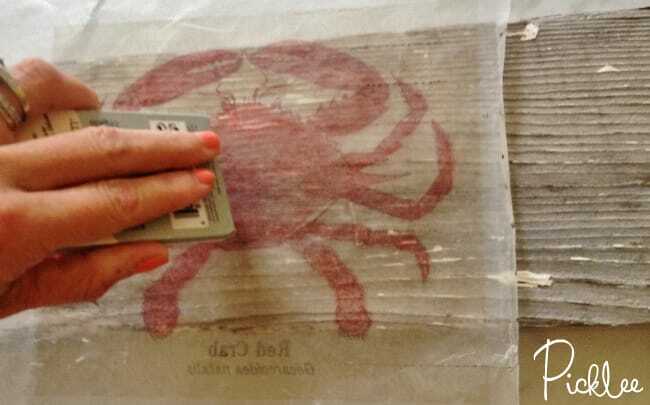 If you take a strip of painters tape and put in on the wax paper along the edge that first goes into the printer, the printer will then have something to grip and should work better. Print your lettering on to the wax paper also. Remember to flip horizontally before printing in order to read the right way. Thank you i thought it was very difficult! Fantastic tutorial on using every day materials vs expensive craft materials for assistance in crafting. Wax paper is cheaper than regular paper! If you are afraid of putting wax paper in your new printer – I don’t have a spare one to play with, you can get the same effect printing on regular copy paper. I’ve never tried colored ink but black works like magic. Just cut out around your image, place face down and color over the back (plain white side of the paper) with a pencil and Voila perfect image transfer. You do have to press rather firmly on the pencil and make sure you are getting all the details. If you are printing words remember you will need to print them as a mirrored image so they come out right. Every program and printer is different – I refer you to your operator manual or help file for instructions on how to do this with your project. I’ve transferred photos onto regular cut boards but never driftwood. Can’t wait to try it! Wax paper has never worked for me so I print on the waxy side of freezer paper. Works like a charm. There are a couple of tricks I have found on the internet for doing this that might help and have been talked about in other comments. 1. after designing your project to print on the wood and click on Print. select Properties and then on MORE – I have an Epson then select Mirror Image and it will flip it over when it prints so the words are backwards but correct when you flip the page and put on the wood. and 2. I use a glue stick to tack the wax paper to a regular sheet of copy of paper and then put in the paper feed. that way it is thicker and gives the printer something to grab onto. I have never been able to print on wax paper and I finally found a better way. Print your image reversed on plain paper. It must be a laser printer. Tape the paper down were you want it. Put on gloves and wipe the paper with acetone for a bit. Pull paper off and let it dry. Done. Hi John, that’s definitely a great option for someone who is looking for a more therapeutic process! Tape the wax paper to a regular piece of computer paper at the top in two places with scotch tape. Be sure to put the wax paper in so that the printer will print on it and not the back of the computer paper. Set your program to reverse image and you are ready to print. You can also use clear sheet protectors with the two sides and bottom edges cut off very carefully. I have used this process for image transfer from a reverse image (done in a simple photo editing program. 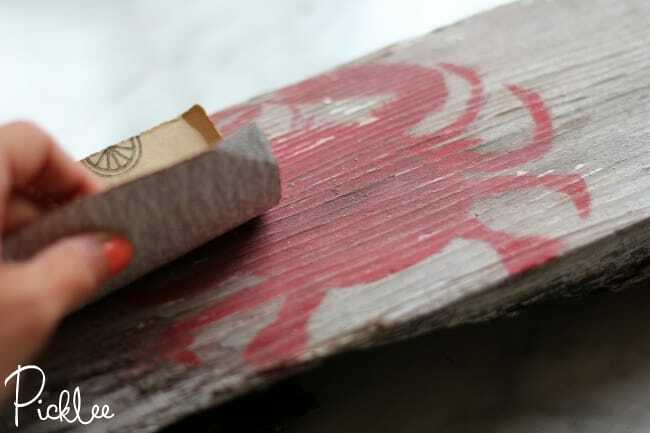 The manner of transfer is the same – use something like a credit card to rub the image onto any piece of wood or other material you think suitable. Also try freezer paper or vellum.